Azerbaijani female Paralympic athletes have participated in the 3rd international parachuting sports festival "HANDI FLY Euro Challenge - MOSCOW 2018" held in Krutitzy Flying Club, Ryazan region of Russia. 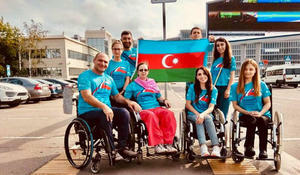 Azerbaijani paralympic swimmers have concluded their performance at the Grand-Prix tournament in The Hague, The Netherlands. Four Azerbaijani Paralympic athletes will vie for medals at the 7th Fazza 2016 IPC Powerlifting World Cup in Dubai, the UAE. Azerbaijani Paralympic athletes will vie for the medals at the World Championships in Suhl, Germany from July 17-27. Azerbaijani Paralympic athletes won two gold, five silver, and three bronze medals in the sixth International Athletics Competitions, which was held on February 20-26 in Dubai, the UAE.